This consultation process provides an effective and practical structure for cooperation. It ensures support and ownership for the program at the policy level, as well as practical collaboration at the technical working level. 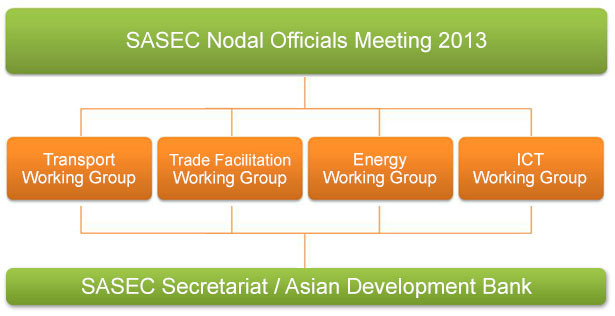 The various SASEC discussion platforms help countries plan and coordinate development initiatives at a regional level, and then prioritize and implement at a national level. Gathering regularly at all three levels allows the SASEC countries to develop effective mechanisms to further cooperation and trade. To carry out the agreed actions of the technical working groups, SASEC sectors establish discrete sub-committees, as necessary, that also bring together all the partners on a regular basis. The SASEC Customs Subgroup (SCS) was established in 2013 by the trade facilitation working group to promote subregional trade facilitation initiatives through concerted Customs reforms and modernization, strengthened inter-agency cooperation, and enhanced partnerships with the private sector in order to eliminate non-tariff barriers to trade development. It also discusses and agrees on action plans for the Customs-related strategic thrusts under the SASEC Trade Facilitation Strategic Framework, and on national and regional capacity-building programs for member countries. The SASEC Electricity Transmission Utility Forum (SETUF) was established in 2013 as a technical sub-committee of the energy working group of the energy working group and aims to play a key role in developing cross-border power transmission connectivity, and promote greater power trade between the SASEC subregion and Sri Lanka. It also serves as a vehicle for knowledge exchange in the development of cross-border power transmission infrastructure.